We lived in The Grove from 1969 until 1994, after ‘emigrating” from Melbourne where we had lived all our lives until then. When we downsized/rightsized after the children left home, we remained in Mosman, in Clanalpine Street. We jocularly said we had gone over the hill, but only geographically. During the 25 year period in The Grove, our daughters attended Queenwood School for Girls, just around the corner and down the hill. They then travelled, followed their careers, and moved on to fulfil their lives. The Grove was a delightful street in which to live. Neighbours were neighbourly in the best sense as we all lived our own private lives. They were available for help but without being intrusive. Many cheery waves were exchanged when we saw each other, anywhere.. The view over Balmoral and through The Heads was a constant reminder that we were in Sydney. 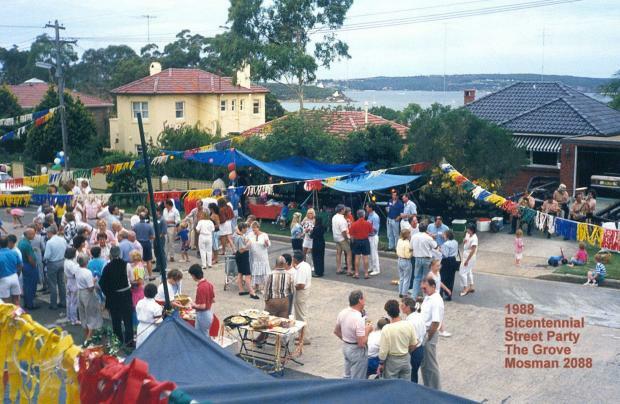 During the 1988 Bicentennial Year, we had one of the many street parties which were part of the celebrations. A band was hired, every house provided food and drink, and the road was closed to traffic for a few hours on a Sunday afternoon. For those who knew others only by sight, the opportunity was taken to have a chat and talk about the kids who had grown up in The Grove, and anything else that came to mind. The event cemented the happy ambience of the street. It was a memorable day. Attached is a photo of the happy occasion. My great grandparents Hugh and Augusta Harvey built a large house on a block that fronted The grove and had access to Little Street in 1916. It was called Wyong and they lived there with their family until 1922 when they moved to 42 Moruben Road. Around 1920 the frontage to The Grove was subdivided and sold off. This created the three houses 8-12 The Grove. The block, known as 11 Little Street, now has a huge monster of a house sitting on it. Is Wyong the house you are referring to? The Grove is a special street. Next door was John Butler, who was responsible for the paint “stain” on the street. He rolled a can of paint which unexpectedly sprung open. Oops. His Dad was Professor Butler, who was a major mover and shaker in the new science syllabus, which was part and parcel of the (then) new Wyndham Scheme. Prof Butler and Prof Messell wrote the lovely new blue textbooks. Two of them. Down the road was Prof Yeomans, further along was Darryl, the registered nurse who sold motorcycles to some who have posted here and a kit of Ludwig drums to me. In the middle was Geoff Lane, who played guitar in one of our bands. All up and down the street were folks whom had made a mark. The noise of the crash brought people out – faintly embarrassing – but everyone was happy to sort me out and see me on my way. Some of the houses in The Grove were owned by farmers, who visited rarely. Neighbours looked after the places.